So Thanksgiving is over and I’ve been thinking a lot about Christmas. This is the first year since I was 5 that I’m not either in school or teaching/travelling. It’s the first year I’ll actually have time to do some of the things I’ve always talked about doing for Christmas like decorating my house and getting a real tree. Only time will tell if I actually get around to these things, as there’s much more I have on my holiday to do list. I visited the local wood shop last week for the first time, other than sourcing wood for school projects. I did a little research on different types of wood after I decided I’d make a small wooden gift for everyone in my small family. I’ve done woodworking before, but nothing too far outside of the pine and plywood category. As easily as I could’ve spent $100+ there I managed to leave with 30 dollars worth of birdseye maple, walnut and padauk. As much as I’d love to share some of the models I’ve drawn up and in process shots of what I’m working on, I don’t want to ruin the surprise for the 3 readers who will be unwrapping them for Christmas. I’ll be sure to make an update post after the holidays are over! Over the last week or two I’ve been readying my Ebay store for holiday shopping. Since I’ve been spending this year trying to save money and develop a business that will allow (and finance) me to make art, I’ve been trying to find ways to make more money. In preparation for Christmas, I’ve been working about twice as much, and plan to keep the pace up next year if my profits reflect the extra work. 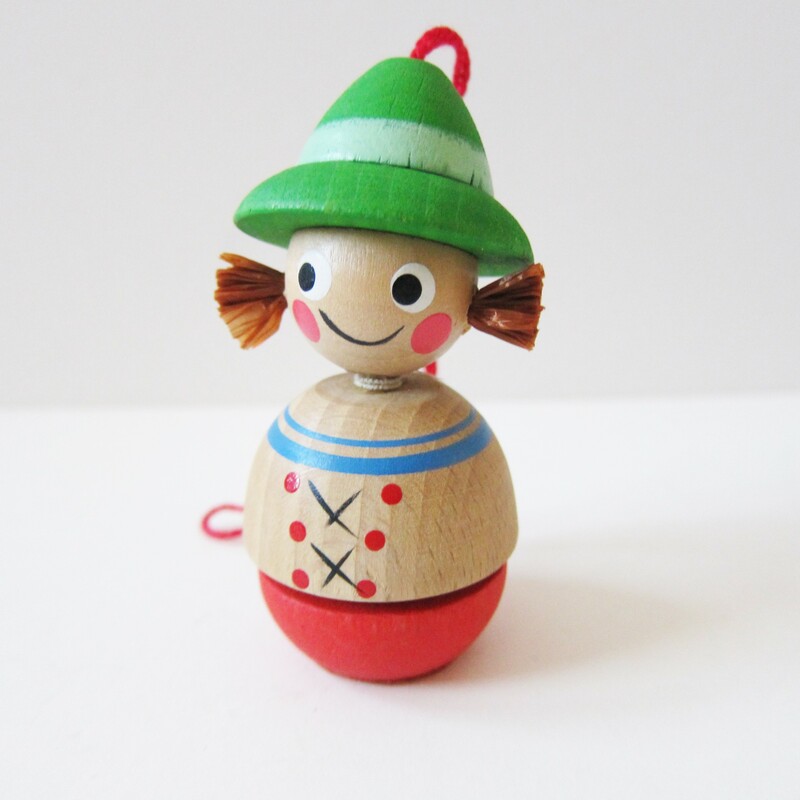 A friend of mine gave me a box full of vintage Christmas ornaments to sell on commission, so I spent all of last week listing as many of them as I could before Black Friday/Cyber Monday. While listing these I ran across a handful of vintage Putz houses. I never knew what Putz houses were before but now I’m totally into them. 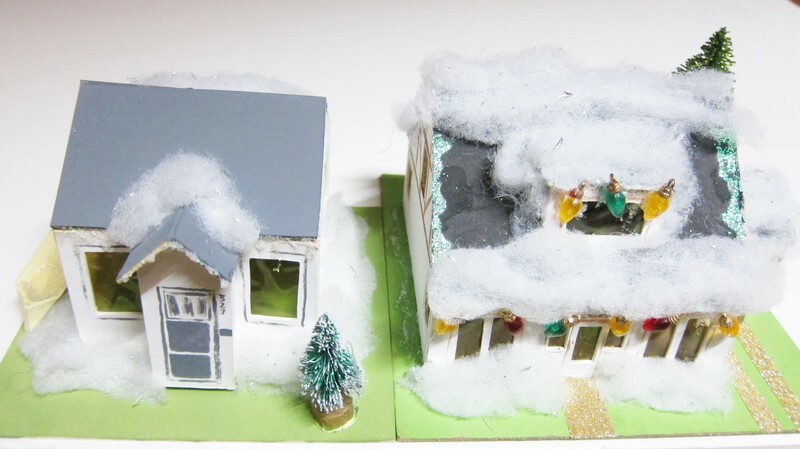 According to an article on Retro Renovation “These glittery little holiday houses date to 1928 — invented by the Japanese, likely building on the concept of the similarly small “candy box” houses that they had been making for the American market. Their “golden years were from 1928 through 1937, when the looming war discouraged consumption.” After reading a bit about the houses, my mom and I spent a night last week watching TV and building our own. I’ve never been much for holiday decor, as I have a theory that it lives in closets and slowly reproduces (the amount of estate auctions I’ve been too with closets full of tinsel, bows and wreaths confirms this). Still, I love the idea of making anything I can to decorate. I wanted my Putz houses to be something I could hang onto for a long time and that would remind me of where I am now. I made one of the tiny little house I rent now and another of the big pretty Tudor revival I grew up in. I included every detail (down the the derelict kayak in our yard) but somehow forgot to include chimneys. 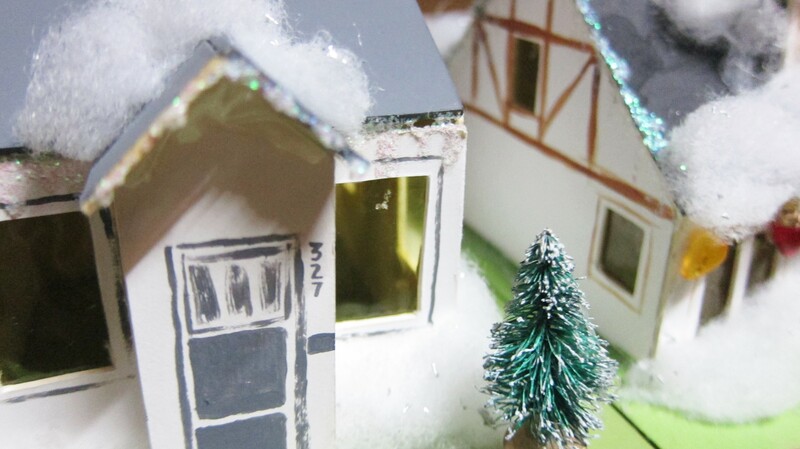 I made them from leftover mat board, cellophane for windows and as much glitter and fake snow as I could glue on. They don’t look like much now, sitting on my coffee table, but should hopefully shine when they’re lit up and put under my aluminum tree.